This week we have continued to look at the story of Noah’s Ark and have created our own display in the classroom. We chose what we wanted to put on the display and helped to create a boat, a rainbow, a dove, Noah, a raincloud and some animals. Once we had put everything on the board, some of us had a go at writing some labels for the things on the board. Here is a picture of our great Noah’s Ark display! This week’s sounds are: ‘x’ ‘y’ and ‘z’. We have discovered that we don’t see these letters often in words and looked at some words where they appear. We have continued to segment sounds in words and have started to look at longer words such as gran (g-r-a-n) and stamp (s-t-a-m-p). This week we have been doing lots of literacy activities including using the Cheeky Chimps. The Cheeky Chimps help us make words by placing sound tiles on their bodies so we can blend and segment the sounds. This week some of us have been doing guided reading and looking carefully at reading sentences and taking it in turns to read a page. After reading the book we have been answering questions to ensure we have understood the story. We have had plenty more writing opportunities this week including whiteboards and name cards to write our names, cursive letters to form our letters correctly and cursive handwriting patterns. The children have been enjoying having a go at these activities and many stickers have been awarded for excellent effort. 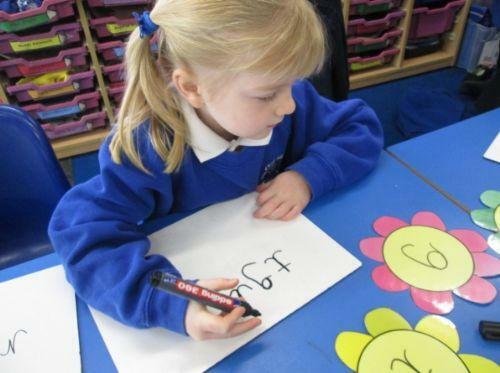 The pencil control when writing has certainly improved and the children are starting to get excited about writing. We have continued with rote counting to 100 and counting in 2’s. We have been revising one more and one less than a number to 20. We have also been looking at finding the total of two groups together and if objects are moved into another group do we still have the same amount. We have also been looking at ordering numbers from the smallest to the largest up to 20. There is now a maths table in the classroom where a maths based activity is provided every day for the children to approach if they wish. This week children have been practising writing their numbers using number lines and 100 squares for support. There have been 2D shapes that children have been making pictures with. We have had the Compare Bears for pattern and sorting and we have had the cubes and numbers to carefully count the correct amount. This theme will continue throughout the term. If your child mentions an idea they have about travelling in any way, please let us know so we can incorporate it into our planning! If anyone works for the airlines, please make yourself known to Mrs Turrall as we have an exciting activity lined up for the near future!